In the concrete jungle that is New York City, there’s an entire world of wild, yet edible plants and mushrooms. For many, this is likely surprising news, but it’s exactly the type of information the aptly named “Wildman” Steve Brill loves to share with New Yorkers. 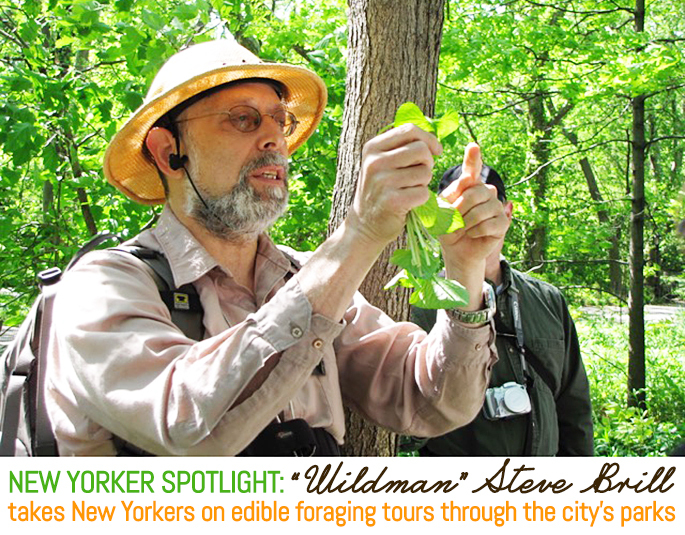 “Wildman” Steve has been foraging New York City’s parks and surrounding areas for over 30 years. He even goes so far as to refer to them as his supermarket. However, he didn’t always have wild in front of his name. In fact, it was a budding interest in cooking that led him to the edible world. 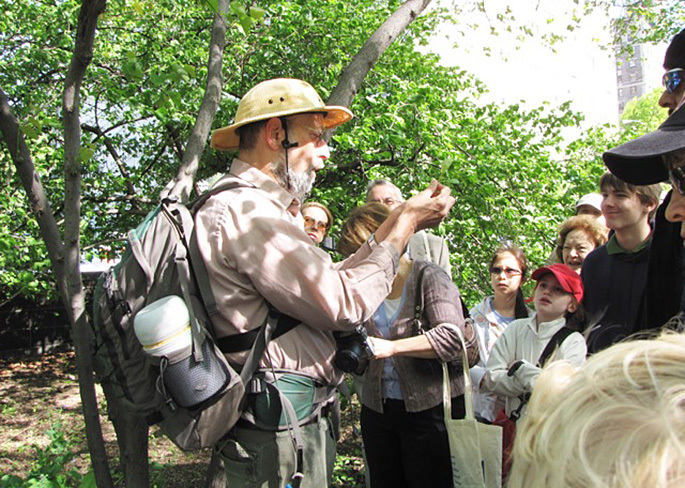 Over the years, his interest blossomed into a business leading foraging tours in New York and beyond, where he introduces newbies to the activity and teaches them about ecology, nature, edible and medicinal plants, and mushrooms. 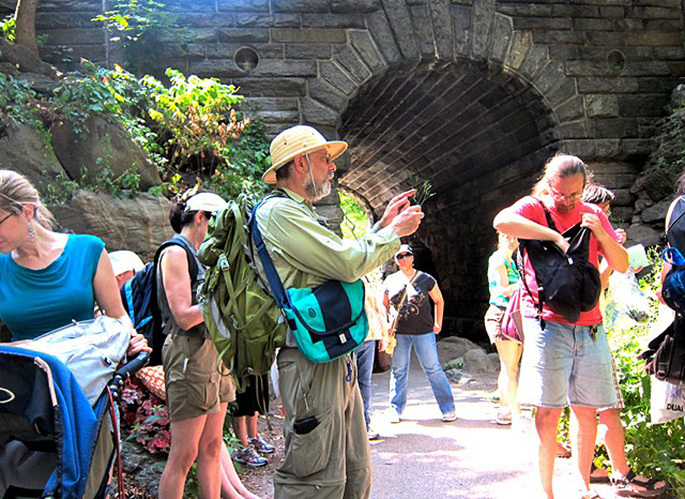 His tours take him through many of New York City’s parks including Central Park, Prospect Park, Inwood Hill Park, and Forest Park. “Wildman” Steve has the privilege of working on a regular basis with a wide range of New York schools, universities, institutions and camps, as well as hosting birthday parties for budding naturalists. We recently caught up with “Wildman” to learn all about foraging and the natural world that exists within the city (and even got a few recipes). Foraging isn’t a skill typically associated with New York City. How did you become interested in it? Wildman: My foraging is an outgrowth of an interest in cooking. I was hungry one day while I was making an unsuccessful effort to become a chess master. I found a carton of oatmeal in the kitchen cabinet and followed the recipe on the side, and it came out quite well. I gradually got more involved in cooking, graduating to the recipe on the side of the raisin box. I was bicycling in Cunningham Park in Queens, and there were women dressed in black. They were traditional Greek immigrants. I asked the women what they were doing, but I couldn’t understand a word because it was all Greek to me, literally. I came home with a bag of grape leaves, which I stuffed and they were quite delicious. I went back in the fall and the whole park was decked out with fox grapes, which are wild concord grapes. I started using those for cooking. I got a book about foraging. No one was teaching it, so I had to teach myself. The books were mainly written by botanists and not very good. There was a lot of inaccurate information. I learned to identify the plants and did my own experiments learning how to use them. I am still coming up with new methods all the time. At what point did you realize you could start a foraging tour business? Wildman: I was having so much fun foraging. No one knew about it. I was teaching cooking classes and it really wasn’t going anywhere. I thought, why don’t I try foraging classes. So I started doing my tours in 1982, and in 1986 I had the good fortune of having a photo taken by undercover agents of me eating a dandelion in Central Park and getting a huge amount of publicity after years of being harassed by NYC Park Rangers. Fortunately, they arrested me on a Monday and there wasn’t much other news around. I was on page one of the Chicago Sun-Times, page two of the New York Daily News, and I was on the CBS Evening News and Letterman. It was the best thing that ever happened to me in Central Park. The Parks Department later hired me and I worked for them as a foraging naturalist. Eventually, I was told by former parks commissioner Adrian Benepe that the reason they had gone after me in the first place was that they were afraid if they tolerated foraging, someone might pretend to have been poisoned, sue the city, and cite me as proof that foraging was allowed. Wildman: I have been doing transcendental mediation twice a day for 20 minutes for 40 years. I was meditating, planning to launch my career as a foraging teacher, and the name “Wildman” just popped into my head. I thought, “This sounds perfect. I’m going to use this nickname.” It felt very weird when someone called me about foraging and I said for the first time “Wildman” Steve Brill, good afternoon.” No one had called me that before, but it worked. Where in New York City would non-foragers be surprised to learn there are edible plants? Wildman: Not understanding the environment, people think you have to go out into the country. There are so many deer outside the city, you actually find more plants in the city parks, otherwise known as weeds, which are edible. Outside the city, there are no predators eating the deer, so they just continue multiplying until they run out of vegetation. City parks also have more habitat variety and a combination of native and foreign plants. Within Manhattan, is there something that people are most surprised they can eat? Wildman: There are hundreds of things. One is mulberry trees, which are everywhere. They sell them in the stores from other countries and regions like the Himalayas. Mulberries happen to be perishable, which took me years to figure out. The mulberries we have here have just as many antioxidants. They are incredible. There are techniques to collect them. If you want to make a mulberry pie, find out where the trees are and then have branches close to the ground that you can reach. Burdock is used in Japanese cuisine and you can get delicious recipes with that in Japanese restaurants. My recipe book has my own version of a recipe with carrot, ginger, sesame or peanut oil and then you add a Japanese wine and let it simmer and tenderize it for about 20 minutes. It took me two years to figure out a recipe. There is a plant called bitter dock, which for decades I would not use because it is bitter. I realized that when you cook it, it loses its bitterness. It can overpower other ingredients, but I realized if you marinate it, it’s incredible. Wild, bitter, leafy plants are incredible for turning into vegetable chips. I coat it with a purée of herbs, miso, pine nuts, and sesame oil, and roast the leaves like kale chips, and everyone who’s tried them on my tours—especially after gagging on the awful-tasting raw leaves—loves them. As far as the five boroughs, does one of them have greater foraging opportunities? Or is each unique unto itself? Wildman: Each park is different. I guess the worst park for foraging tours for me is Prospect Park because there are so many plants, and I can never show everyone all the plants that are in season in just four hours. For people who are new to foraging, the salient factor isn’t the number of edible species, but recognizing the plants that are all around them. There are so many plants in all the parks. Once you learn them, you have a supermarket. Of course, there are some places where these plants are not in great condition, so you leave them alone and look for the same species in a better location where they’re thriving. Can you give a few examples of the type of tours you lead? Wildman: I do lots of private tours for schools, as well as birthday parties. I work with parks departments, environmental organizations, teaching farms, museums, health food stores, nature centers, nurseries, land trusts, farmer’s markets, and hiking clubs. I recently did a tour of Green-Wood Cemetery. 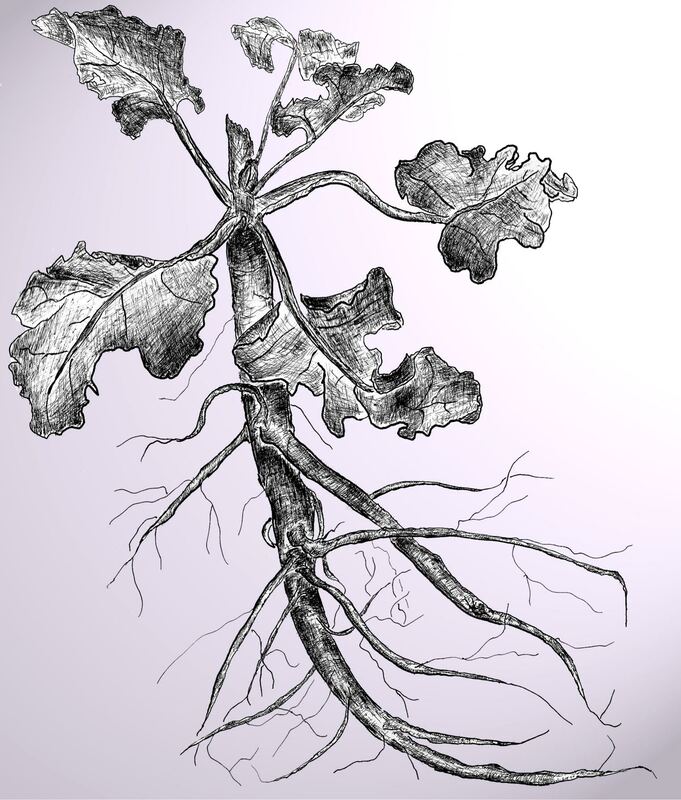 There is burdock around graves, and it felt like there was someone pulling this deep root down as we pulled up. I even did a tour once for parrots, which was quite unusual. There is a group called the African Grey Society, these are people who own African Grey Parrots. These birds are incredibly intelligent, but the owners, who were very friendly and paid me well, were afraid to try anything that didn’t come in a package. So during the tour, I started showing the plants to the parrots. They paid attention, they were smarter than the owners, and they and ate enjoyed what I passed out to them. One parrot, who perched on my arm for the entire tour, became my friend. Your daughter Violet is a budding forager. When did she begin joining you on tours? Wildman: Not until she was two years old did she come on the first tour. She’s been on thousands and thousands of tours. She used to run around and play and pick up the plants. In recent years, she told me she wants to teach foraging when she grows up. I try to teach her and she says, “Daddy I know that one” or “Look Daddy, behind you there is a hairy bittercress.” She’s great with other kids. One of the most fun things for me was when we did a tour at Ramapo College and she stood there with all these professors with her mouth open trying to catch every word. With all this foraging, how often do you need to go to the supermarket? Wildman: There are lots of things that I buy at the supermarket. About 1/10 of my food comes from the wild. If you could choose one wild plant that epitomizes New York, which one would it be? Wildman: There are so many. Maybe wood sorrel, a plant that can grow up to a foot and a half tall with three heart-shaped leaves (clovers, which look similar, have oval leaves), yellow, five-petaled, radially symmetrical flowers, and spindle-shaped seed pods. What does sharing foraging with New Yorkers mean to you? Interested in joining “Wildman” Steve on a foraging tour? The list of upcoming tours can be found HERE. If you’re looking for a preview, Inhabitat recently produced a fun video about foraging in Brooklyn with “Wildman” Steve that can be found HERE. Here’s a very tasty condiment you can use to coat vegetables before baking them, as a spread, or to add flavor to soups or stews. 1. Purée all ingredients in a food processor. I find bitter dock quite unplatable raw because it has such a bitter aftertaste, but it’s good cooked, especially when you transform it with sweet herbs, and bake it into wafer-thin chips. 1. In a bowl, use your hands to gently fold the Sweetened Miso Dressing into the bitter dock leaves. 2. Transfer the leaves onto 3 oiled non-stick baking pads over 3 cookie sheets, or onto 3 oiled cookie sheets, and bake in a preheated 300° oven for 40 minutes, or until crisp and lightly-browned, but not blackened. 3. If you have leftover leaves, repeat step 2.